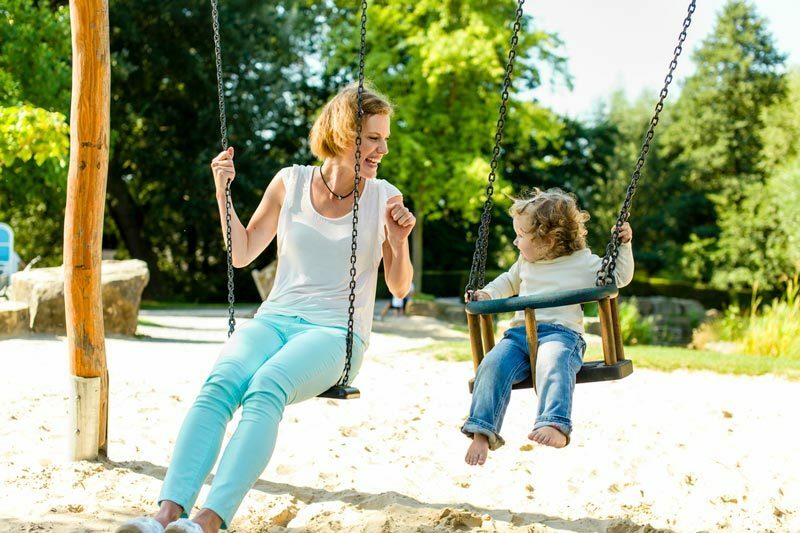 As a mum of two little boys, I’ve spent A LOT of time in playgrounds. While parks are lovely places to be, they can also be as monotonous as reading Where Is The Green Sheep 100 times over. This means that while helping my little one slide down the big slippery dip over and over again, I’ve indulged in some people watching for my own amusement. I’ve come to the conclusion that there are nine types of other mums at the playground. Which one are you? This poor mum has bags under her vacant eyes and is slumped on the park seat. She doesn’t feel like engaging with anyone else while watching her kids scramble up the climbing frame with more energy than baby chimps. She just needs a caffeine hit, but she couldn’t be bothered unbuckling her kids from their car seats to pick up a takeaway flat white en route. Now she is regretting it. This mum is in stark contrast to ‘I need coffee’ mum. She’s wearing her Lorna Jane attire and has just done a workout at the gym while her kids were in the creche. She annoyingly has a spring in her step and coffee mum chooses to ignore her. This mum bakes homemade goodies for the park and then shares them around. I love this mum because not only have I not eaten enough breakfast, but I also only packed bananas for my boys as snacks. Her homemade muffins are way more exciting. Then there is the soliciting mum. This mum starts up a friendly conversation: “Oh, he’s so cute! How old is he?’ and then makes you uncomfortable by trying to sell a product to you and in the process revealing her ulterior motive for talking to you. While you politely decline her invitation to attend her ‘whatever it was’ demonstration, she quickly moves on to the next victim. She wears yoga pants and has a serene demeanour and you can’t help but stare, wistfully thinking if you just got the same yoga pants you may be as calm as her. But then you see her kid has his 100-seed bread sambo wrapped in beeswax, is drinking out of a metal drink bottle and she’s got her baby in cloth nappies and you realise she must be stressed trying to keep that level of organic and natural only life up. Every so often you get chatting to another mum who you feel an instant affinity with. Everything she says you agree with and her husband even sounds just like yours. Her kids are the same age as yours and right when you are about to suggest a playdate, she rounds her kids up and bundles them into the exact same car as yours because she forgot about an appointment she’s now late for (so you!). This mum doesn’t look up from her phone, not even when her kid has been flung off the roundabout and is sitting in a dizzy pile. She also doesn’t see when her other kid is throwing sand in the eyes of the other children. She’s busy on Facebook. This mum lets her kids bring toys and scooters to the park and then gets annoyed when other children want to play with them. She will tell you off if your child is having a go on her child’s scooter and you can’t help but wonder what hope her kid has at learning how to share. We have all been this mum. Her toddler is throwing a tantrum over leaving the park while her baby is screaming to be taken home for a nap. This mum is having a hard day and while you know you can’t really do anything for her, you give her a ‘been there too’ smile and even though she’s frazzled she smiles back. Mum camaraderie is strong.